I woke up this morning determined to get rid of at least one little project that I had stashed away in a Baggie or food container. They are every where in my sewing space. Ideas I ran across and started making blocks or cutting scraps. Then stashed them away for later. Well now IS later. 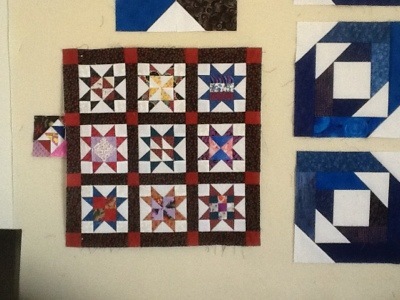 The first up is the Summer Stars from last summer hosted by Temecula Quilt Company. They posted one 4.5″ star each week for eight weeks. I made four and stopped. However, I did finish all the flying geese for the star points. So today I sat down and finished the rest of the stars and got them into a top. Now I just have to decide on borders. Second, I grabbed a Baggie of tumblers I started cutting from scraps years ago and started sewing them together alternating dark and light. There are not enough for a top yet, but it feels good to have them sewn together and gives me some motivation to cut more tumblers next time I’m cutting up scraps. These two little projects made only a small dent in the stash of miscellaneous projects, but it’s a start.